The Actor: This individual desires inter-personal relationships with others and has learned enough social skills over time to pass as a “neurotypical” (i.e., he or she can “act” like someone who is not on the autism spectrum). The Outcast: This individual desires inter-personal relationships with others, but has difficulty finding and maintaining friendships due to a lack of social skills. This person really wants to “fit-in,” but usually gets ostracized from “the group” due to his or her “odd” behavior. The “Loner” displays a persistent pattern of detachment from social relationships as well as a restricted range of expression of emotions in inter-personal settings. He or she (a) almost always chooses solitary activities, (b) appears indifferent to praise or criticism from others, (c) has little interest in having sexual relations with a partner, (d) lacks close friends other than first-degree relatives, (e) neither desires nor enjoys inter-personal relationships (sometimes including being part of a family), (f) shows emotional coldness, detachment, or flattened affect, and (g) takes pleasure in only one or two (solitary) activities. “Loners” often engage in a rich, elaborate and exclusively internal fantasy world. They are frequently (but often unintentionally) standoffish, cold and unresponsive, which causes relationship problems. These individuals have trouble expressing their feelings in a meaningful way and may remain passive in the face of unfavorable circumstances. Because of their lack of meaningful and intimate communication with others, they are not able to develop accurate images of how well they get along with people. Such images are important for the individual’s self-awareness and ability to assess the impact of his or her own actions in social situations. When the “Loner’s” personal space is violated, he feels suffocated and feels the need to free himself and be independent. He tends to be happiest when he is in a relationship in which his partner or spouse places few emotional or intimate demands on him. It is not “people” per say that he wants to keep away from, but emotions, intimacy, and self disclosure. As a result, the “Loner” tends to form relationships with others based solely on intellectual, occupational, or recreational activities (as long as these modes of relating do not require the need for emotional intimacy, which the “Loner” will reject). 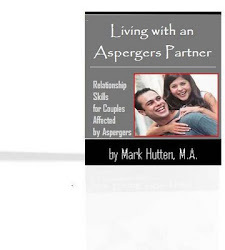 Unfortunately, the Aspergers adult with “loner tendencies” rarely seeks treatment, because her thoughts and behavior generally do not cause her distress. When treatment is pursued, psychotherapy is the form of treatment most often used. Treatment focuses on increasing general coping skills, improving social skills and interaction, communication, and self-esteem. Because trust is an important component of therapy, treatment can be challenging for the therapist, because Aspergers adults with “loner tendencies” have difficulty forming relationships with others – including a therapist! Group therapy is another potentially effective form of treatment, but it generally is not a good initial treatment. Although the “Loner” may initially withdraw from the therapy group, he often grows participatory as the level of comfort is gradually established. Protected by the therapist (who must safeguard the “Loner” from criticism by other members in the group), the “Loner” has the chance to conquer fears of intimacy by making social contact in a supportive environment. Medication might be prescribed, but usually only if the Aspergers individual also suffers from an associated psychological problem (e.g., anxiety, depression, OCD, etc.). Social consequences (e.g., family disruption, damaged relationship with co-workers, loss of employment and housing, etc.) are sometimes disastrous for the “Loner.” Comprehensive treatment, including services existing beyond the formal treatment system, is vital to improve symptoms and assist in recovery. Self-help programs, family self-help, advocacy, and services for housing and vocational assistance supplement the formal treatment system.